BELAGAVI, Apr.2: Just like spectacular colours on his canvas Somanand Maruti Gadakari’s emotions blossomed into celebrations when he found his name among the winners of the prestigious Karnataka Lalithakala Academy award-2016. With the award, which undoubtedly made him and his family happy, came the recognition for his years of dedication and passion for paintings. The award, which carries a cash prize of Rs.25,000, a certificate and a memento, was presented to him and nine other winners of the KLA awards for the year 2016 by chief minister Siddaramaiah at a function held at Mandya on Jan.23, 2017. Kannada and Culture Minister Umashree was also present. Fine art, even as a hobby was never heard in the family the Gadakaris, which was traditionally associated with agriculture in their native Hunnur of Hukkeri taluk. But, Somanand developed a liking for drawing and painting after being inspired and motivated by his teacher, Mr.Badiger while he was studying at the Kannada medium high school in Hire Bagewadi. He picked up pencils and sketch pens, and started trying his hands with brushes and colours, capturing small frames from the beautiful and wonderful natural landscapes and scenic beauties on drawing sheets. 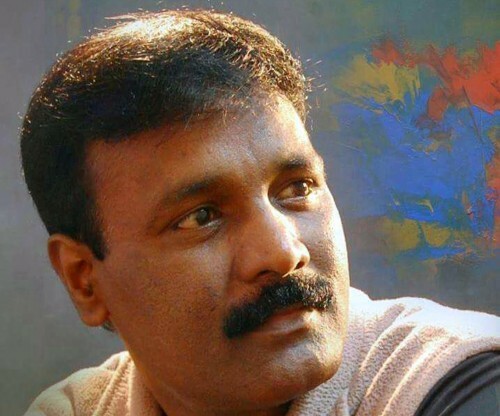 His urge to explore more and learn the finesse of the art of painting, colour balancing techniques, besides techniques of brush-strokes and use of other conventional and un-conventional tools motivated him to take up a diploma course at the Beynon Smith College of Fine Arts in Belagavi city. It was at this college where his creative instincts started taking proper shape with his brushes starting listening to his imaginations. However, the circumstances in the family compelled him to find a job first for survival. Accordingly, he joined the Karnataka police department as constable in 1999. Presently, he is serving as a head constable with the City Reserve Police in Belagavi city. “No, not for money, as I have conducted exhibitions from my own savings from the salary, even when it started with just Rs.3000 per month; recently, my salary has gone up to Rs.25,000 and managing both family and paintings. However, I have sold few pieces when some of the individuals were too keen to have them,” Mr.Gadkari said adding that senior officials in the department always supported his endeavours. And, like a contrasting combination of policing and engaging himself in tough jobs at times on one side and taking out time for his passion on the other side, he uses the contrasting tools – brushes and knife to reproduce his imaginations and plots from the nature on a canvas. 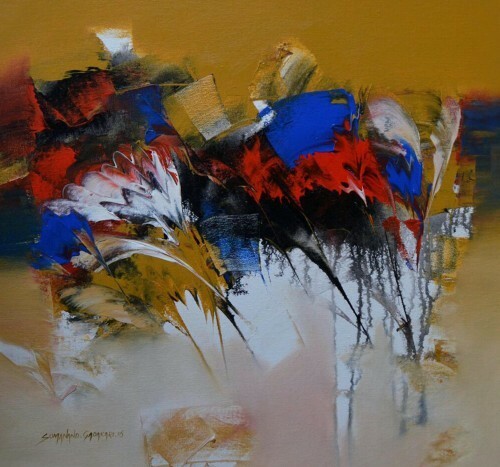 Of late, he is specialising in abstract paintings using both brush and knife. “I will keep creating new paintings, which is more of an obsession than passion,” Mr.Gadkari says. Eom. So far, he has 400 to 500 nature and abstract paintings to his credit. Exhibition of paintings conducted at Dharwad, Bengaluru, Belagavi, Hyderabad, Kolhapur, and Sirsingi. Participated in 25th and 37th Annual Art Exhibition of KLA at Bengaluru in 1995 and 2007, besides in Belagavi and Sirsangi. Conducted drawing and water colour camps in Belagavi, Dharwad and Hampi. Collections: Bengaluru, Kolkata, Pune, Hyderabad, USA, Mumbai and Deli, so far.